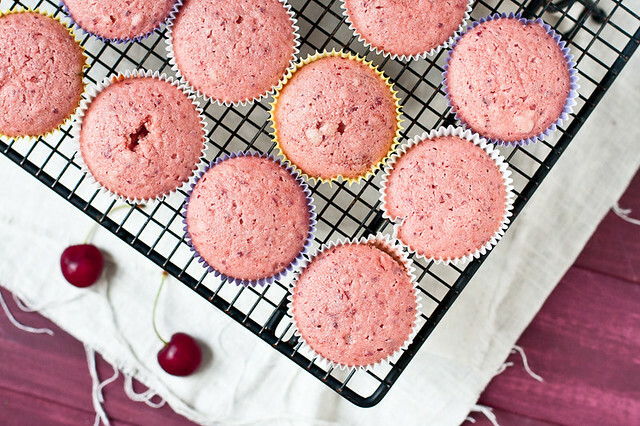 If you’ve ever wanted to make fresh cherry or strawberry cupcakes, you’ve probably run into similar problems: the surprising lack of recipes out there with natural ingredients and real fruit. Because if it’s anything the food industry can do, it’s really process the &^%$ out of something. There’s no reason to use Jello, extracts, and unidentifiable chunks of [fruit]-flavored not-fruit at the height of cherry season. I took my favorite cake recipe (the 1234) and folded fresh cherry puree into the batter along with the tiniest amount of almond extract. The result was a fluffy, moist, pink cake using only real cherries and actually tasted like cherries. Until I dumped a bunch of chocolate glaze on top and then it just tasted like my morning 2-mile run never happened. 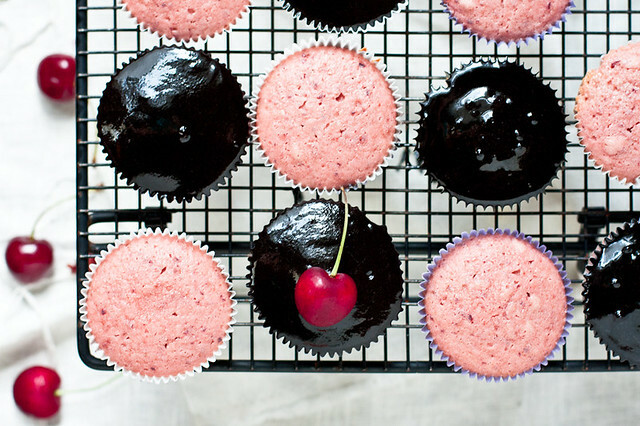 Moist, fluffy, and pink cupcakes made with fresh cherries. *An equal amount of buttermilk or sour cream would also work. I no longer buy buttermilk and just substitute nonfat Greek yogurt in all recipes. Preheat oven to 350 and line muffin tins with ~30 (sorry) cupcake liners. Cream butter and sugar together for ~3 minutes until light and fluffy, scraping down the bowl a couple of times. Place pitted cherries and lemon juice in the blender or food processor and process until mostly smooth. Stir the yogurt into the cherries. Whisk the flour, baking powder, and salt together and set aside. Add the eggs, vanilla and almond extract to the butter and mix until uniform. Add half the cherry mixture to the bowl and mix, switching the speed to low and adding half the dry ingredients. Scrape down the bowl and repeat. If you want to add 1-2 drops of food coloring, here is the time to do that - you don't have to, but if you don't think your batter is pink enough, just add 1 or 2 drops (I added 1 drop of Americolor Red Red). Scoop the batter into the cupcake liners and bake ~18 minutes, until a skewer inserted into the center cupcake comes out with only moist crumbs attached. Cool completely before frosting or glazing. I have some cream cheese frosting in my fridge and a ton of cherries, I know their destiny now. Gorgeous! I like everything with cherries! I’ll admit I hoard fresh cherries. Oh, I love them. I will be making this recipe. They look so good. 1. Yes, I am making these (um, after I move next week and unpack my kitchen). 2. YES YES HOLY MOTHER OF GOD YES re: the “pistachio” muffins. The ones I see always have a walnut topping. I hate walnuts, and WHY are there walnuts on a pistachio muffin, ffs? 2a. Got a recipe for pistachio muffins, by any chance? These are so pretty! Too bad I’m allergic to cherries. 🙁 But I totally hear you on the fake crap. Always prefer the real thing to flavor what I’m eating instead of chemicals and dyes. I wanted to make this for my boyfriend’s birthday, do you know how long the bake time would be for 8″ round pans? ~30 minutes – check it at 25 to see how much longer it should go. Pistachio cake made with NO pistachios is not even a cake. It’s just a travesty. And the same would go for cherry cupcakes without cherries! I love that these are so real. these look delicious! 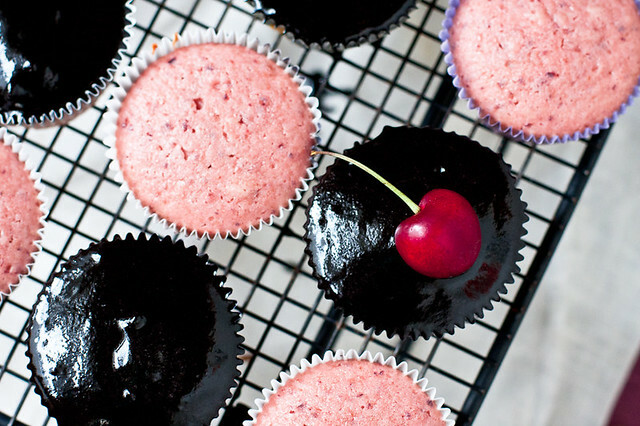 i love the chocolate glaze and the cherry cupcake! Hurray for recipes with real fruit! You’re so right, too often it comes down to recipes asking you to fold in a package of cherry flavored jello… ick. what do you do with the other half of the cherry mixture? Just make another batch of cupcakes? spent hours reviewing recipes for cherry cake made with fresh cherries earlier in the week for a friends B-Day cake. thought this was the one. I live in the Okanogan valley in WA state cherries are just now being harvested, I have fresh eggs in the fridge and now the ingredients have disappeared. I am bummed that the full recipe is gone. Patti, the blog is currently being transferred from one site to another so some weirdness might happen over the first couple of days as technical lingo blah blah. The ingredients are definitely displaying now. Hi there, thanks for the recipe – it’s unclear whether you can use plain yogurt or if it must be Greek yogurt. (I’m not a fan of Greek yogurt so I would need to buy it special for this but always have reg. yogurt – or “yoga” as my 5 year old calls it – on hand). Plain yogurt will work just fine. I made your strawberry cupcakes earlier this week, very yummy. 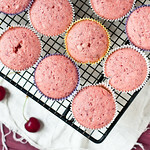 For the cherry cupcakes do you use all purpose flour or cake flour?